For this DIY Series, we’ll teach you how to use products from our site to add the perfect, personalized touch to a baby shower. First, scratcher postcards for a “gender reveal” baby shower. Is it a boy or a girl? 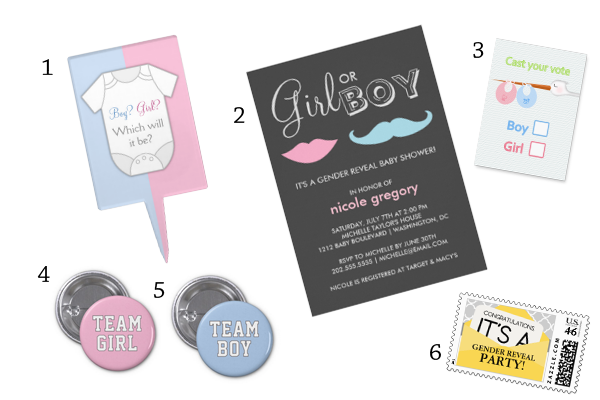 Turn an ordinary baby shower into an occasion to announce your baby’s gender with family and friends. Gather everyone and have them participate in an interactive game, where they’ll have to scratch a card to find the answer. 1. Gender reveal postcard (this is a template product, so feel free to include your own messaging inside the balloons). Step 1: Personalize the scratcher postcard with the correct gender. Step 2: Pour three parts acrylic paint and one part dish soap on a plate. Step 3: Mix the paint and dish soap together. Step 4: Paint inside the balloons to cover the answer, using 2-3 coats of paint. Let the paint dry between coats and repeat until you can no longer see the text. Step 5: Let dry. (It might take up to an hour to dry). Provide the finished scratcher postcards to your guests and hand them coins. Have them guess the gender and scratch to see the answer! Whomever gets it right can get a special treat. In our next DIY Baby Shower series: how to make a unique Flyer Candy Bar Wrapper to cover tasty chocolate party favors. A lot of people use contact paper. Want to make these but am worried that without the contact paper the writing might get scratched off too? How did it go for you is contact paper unnecessary due to the glossy cardstock? We didn’t use contact paper for this DIY, so we can’t speak to how that might work for you. Best of luck!